Available in: 1.1kg, 2.3kg & 5.2kg bags. Deboned Chicken, Chicken Meal, Rice, Ground Barley, Ground Rice, Whitefish Meal, Tomato Pomace, Chicken Fat (preserved with Mixed Tocopherols), Oat Fiber, Chicken Liver, Natural Chicken Flavor, Ground Flaxseed, Potassium Chloride, Cranberries, Chicory Root Extract, Cranberry Extract Powder, Cranberry Fiber, Choline Chloride, Vitamins [Vitamin E Supplement, Niacin, Beta-Carotene, Vitamin A Supplement, Thiamine Mononitrate, Pyridoxine Hydrochloride, d-Calcium Pantothenate, Riboflavin, Vitamin D3 Supplement, Vitamin B12 Supplement, Folic Acid, Ascorbic Acid (Vitamin C), Biotin], Minerals [Zinc Proteinate, Zinc Sulfate, Iron Proteinate, Ferrous Sulfate, Copper Sulfate, Copper Proteinate, Manganese Proteinate, Manganese Sulfate, Sodium Selenite, Calcium Iodate], Mixed Tocopherols added to preserve freshness, Taurine, Glucosamine Hydrochloride, Chondroitin Sulfate, L-Carnitine, Dried Kelp, Yucca Schidigera Extract, Dried Lactobacillus plantarum Fermentation Product, Dried Enterococcus faecium Fermentation Product, Dried Lactobacillus casei Fermentation Product, Dried Lactobacillus acidophilus Fermentation Product, Rosemary Extract, Green Tea Extract. 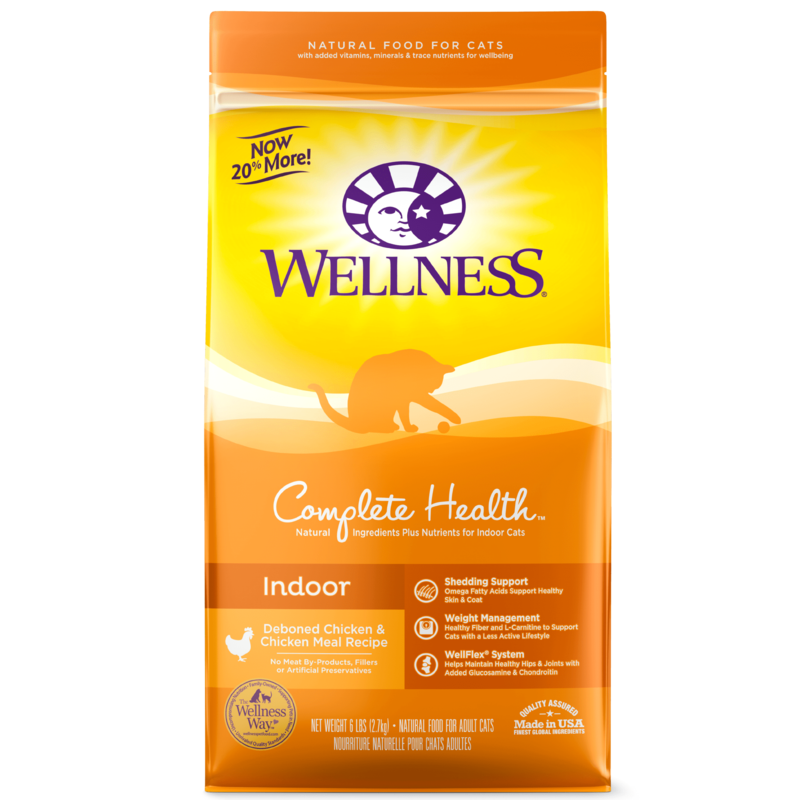 Wellness Complete Health Indoor Health Deboned Chicken & Chicken Meal Recipe Cat Food is formulated to meet the nutritional levels established by AAFCO Cat Food Nutrient Profiles for maintenance. 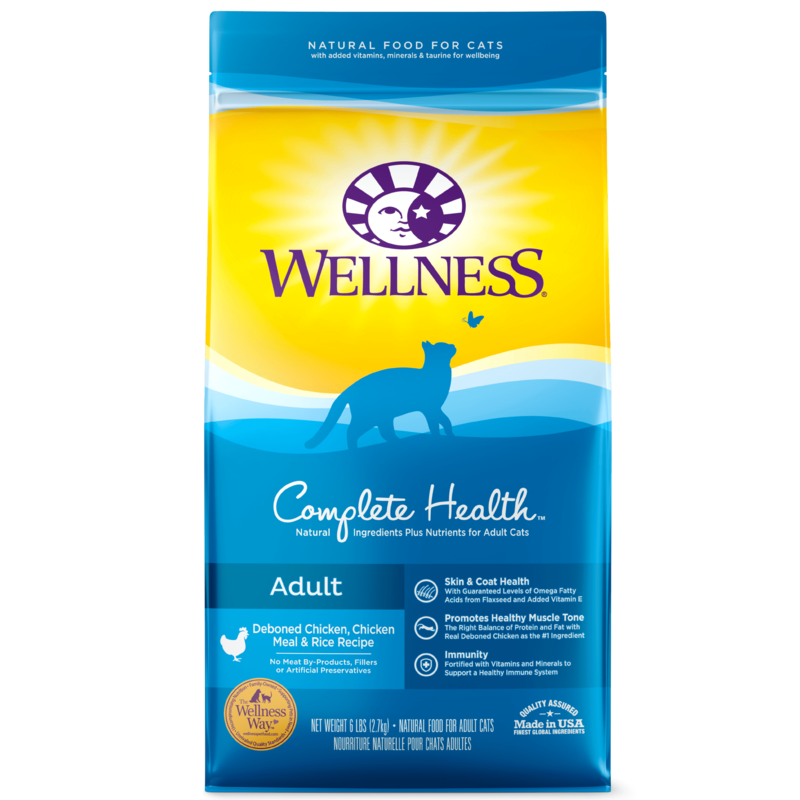 Every cat is a little different, so optimal feeding amounts may vary with age, size, activity level, breed and environment. 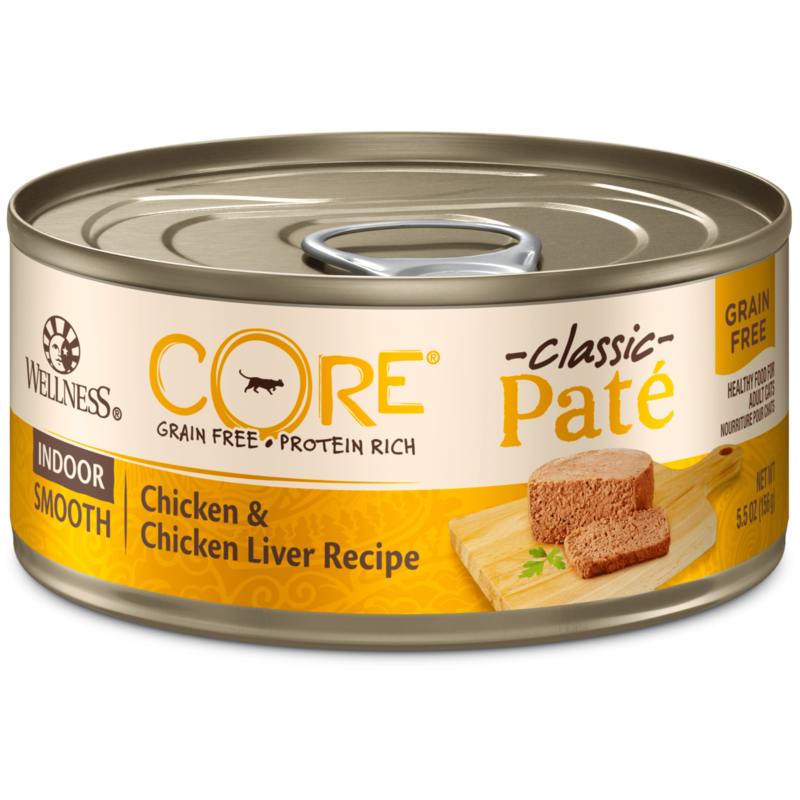 Divide the total grams per day by the total number of times you feed your cat per day. Please use the information below as an initial recommendation only and adjust as needed. CATS OVER 6.8kg: Add up to 29 grams for each additional 0.9 kg of body weight. CALORIE CONTENT: This food contains 3,590 kcal/kg or 465 kcal/cup ME (metabolizable energy) on an as fed basis (calculated).